Home :: Mikrotik Switches :: Mikrotik Cloud Router Switch CRS106-1C-5S complete 5 SFP ports plus 1 combination port 10/100/1000 layer 3 switch and router assembled with case and power supply - New! Mikrotik Cloud Router Switch CRS106-1C-5S complete 5 SFP ports plus 1 combination port 10/100/1000 layer 3 switch and router assembled with case and power supply - New! 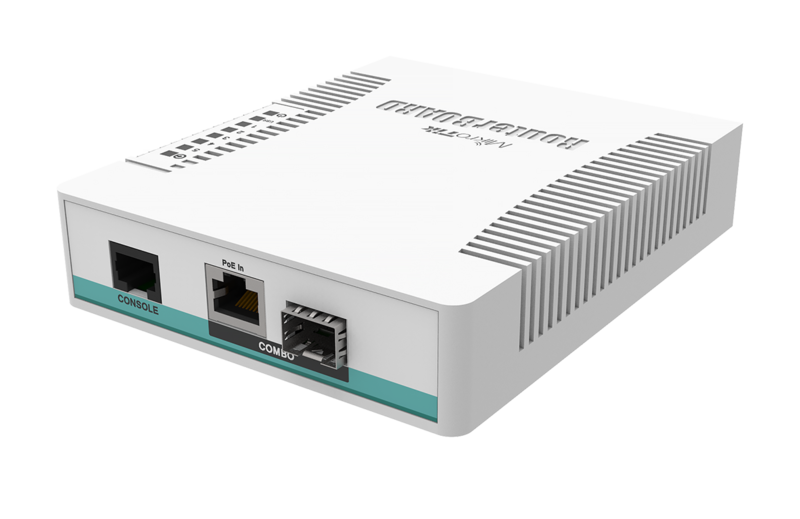 Mikrotik's Cloud Router Switch is a new addition to the CRS product line. 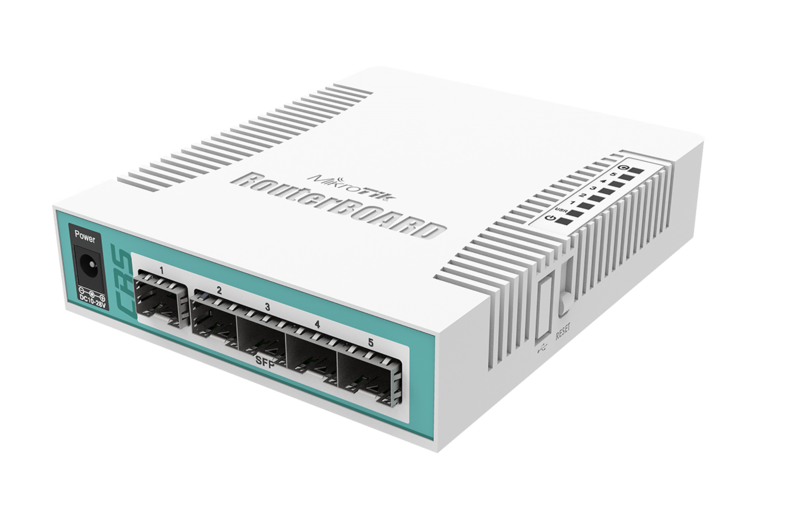 It's equipped with one combo port (Gigabit Ethernet or SFP), five 1.25Gbps SFP cages, desktop case and power supply. 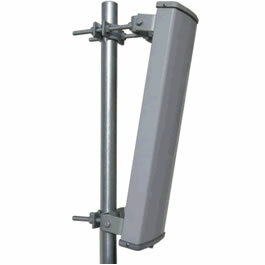 Product comes with 400Mhz CPU, 128MB RAM, operates RouterOS L5 and supports 11-30v voltage input. CRS106-1C-5S supports any 1.25G SFP transceiver that is within the SFF Committee specifications for SFP Transceivers. CRS106-1C-5S doesn’t have hardware support for PON (Passive Optical Network) - this hardware support MUST be implemented on SFP transceiver itself. Note that the SFP transceivers are NOT included. Mikrotik RBSXTG-2HnD is a low cost, high speed 2GHz wireless device. Dual polarization 802.11n and Nv2 TDMA technology help to achieve even 200Mbit real throughput speed - New! 3.5GHz 17dBi Standalone 90 Degree H Pol Sector Antenna with N-female jack - Laird model SAH35-90-16 Mikrotik RouterBoard RB/800 RB800 complete Extreme Performance Router with 3 - 10/100/1000 ethernet ports and 4 miniPCI slots and RouterOS Level 6 - New! 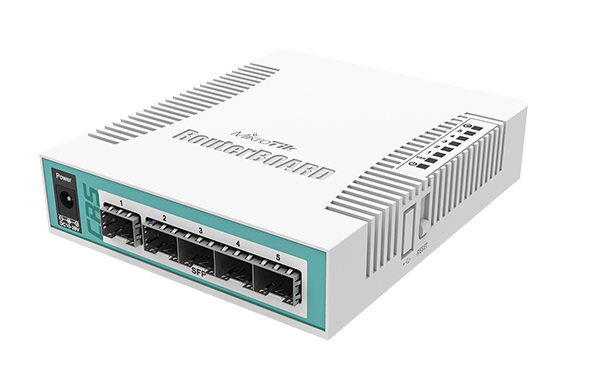 Mikrotik Cloud Smart Switch CSS326-24G-2S+RM is a SwOS powered 24 port Gigabit Ethernet switch with two SFP+ ports in a 1U rackmount case - New!